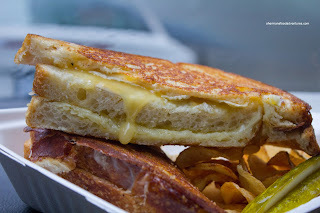 If you read this blog often enough, my son's love for grilled cheese sandwiches is as apparent as Snooki's love of pickles (actually, I think they're the same height... LOL...). When we heard that there would be a food cart dedicated solely to the buttery, crunchy and gooey concoction known as the grilled cheese, it was as if our prayers were answered. 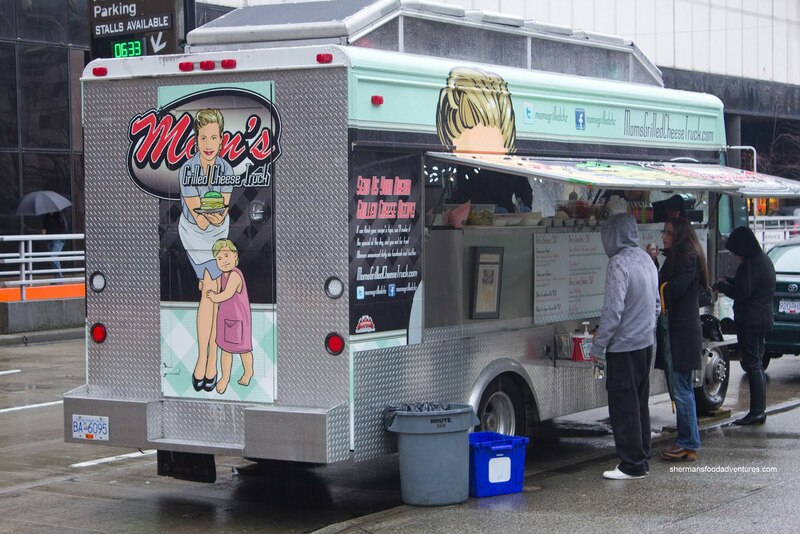 So on a cold winter's day (and I mean cold), I took my son to Mom's Grilled Cheese Truck smack dab in the middle of Downtown. 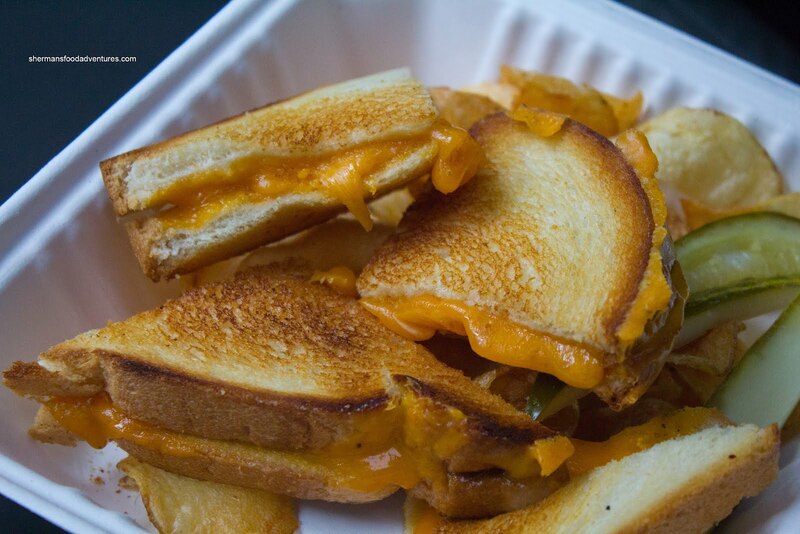 Located during lunch hours on Howe at Georgia, the incredibly personable staff prepare each and every grilled cheese to order. Outstanding commitment to quality, yet on a blustery day, it's an excruciating wait. As a reward for our dedication, the staff offered up samples of their wonderful roasted tomato soup with basil mascarpone. Didn't get a picture of it, but believe me, it really hit the spot. And for once, there was no doubt as to what my son would order - yes, a Classic Grilled Cheese with cheddar on white. It came with a handful of Hard Bite chips and pickles (Snooki would be happy!). What I really liked was the non-reliance on butter to crisp up the bread. Rather, a hot flat top did that beautifully with good colour and texture. Loved that they didn't skimp on the cheddar cheese either (which wasn't particularly oily either). My son liked it very much. For myself, I decided to try 2 sandwiches (which were the only other 2 options) starting with The Jackson 3 consisting of 3 slices of sourdough with Brie, Boursin and Gruyere. This was a somewhat heavy grilled cheese because of the rich cheeses. Most of the flavour was provided by the Boursin and the rest of the subtleness of the other cheeses melted within the crunchy sourdough. I was okay with this one, but I was completely blown away with Mom's Meatloaf Grilled Cheese. What amounted to be a meatloaf melt, this thing was messy and flavourful. The combination of mozzarella and Parmesan afforded both flavour and stringiness. 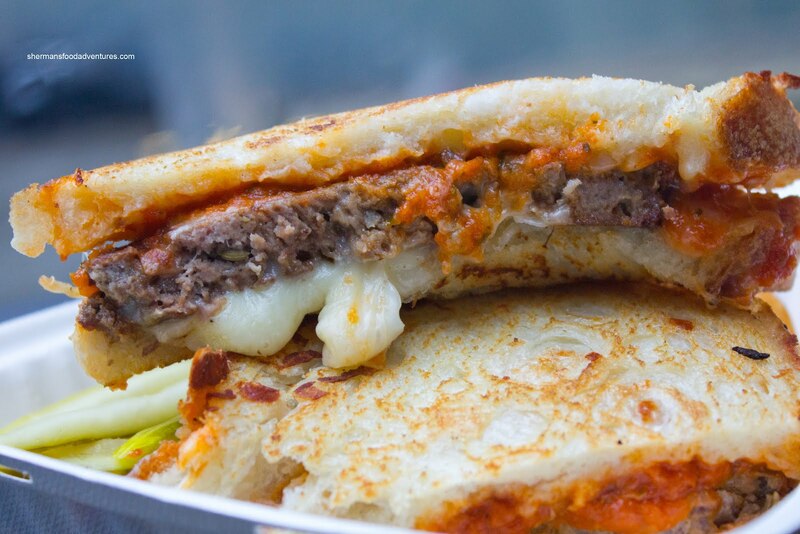 The contrast between the crunchy sourdough and moist meatloaf with a good splash of marinara made this a hearty meal. Okay, I'll admit that I did not have high expectations for the place (it's grilled cheese after all). However, the people and the food make this a repeat visit for sure. And it is not because of my son either! 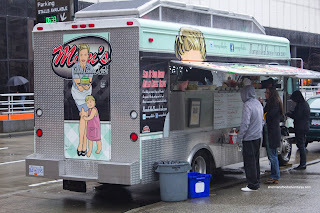 I discovered Mom's GC at the Dine Out Mobile Food Truck event this year. Their soup was the perfect thing for a cold, windy day and I would certainly order the larger portion next time, as the flavours were amazing. They were featuring a ham and apple wood smoked cheese for the event and I was lucky enough to order it before the lines became crazy. I think I want to try the meatloaf one next time as it was also very popular with the regulars. @Holly Loved the food and the people. A real gem.